Manage the resource capability and work load more efficiently with the visual resources overview. 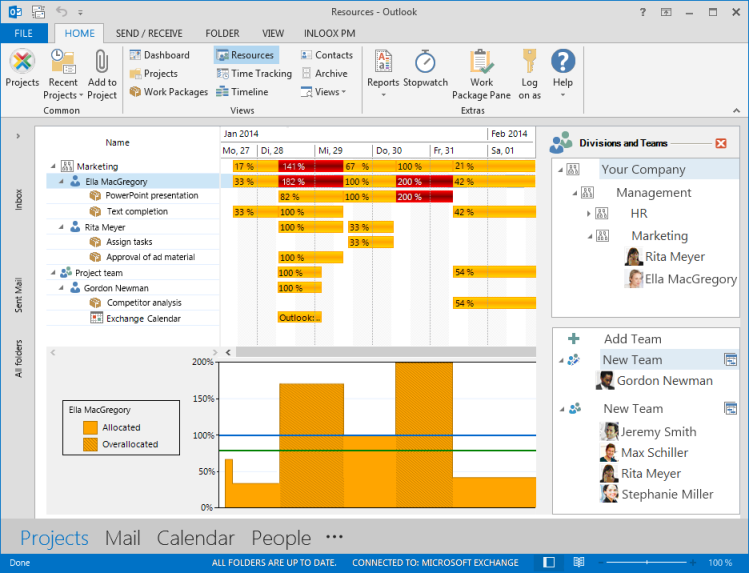 It integrates both project work packages from InLoox PM 8 and appointments from the Microsoft Exchange free/busy service. This way, you always have an instant and complete overview of all project resources – be it team members, rooms, or tools. On the InLoox PM tab, in the Views group, click Resources. The resource overview loads all resources system-wide with added work packages. The overview is structured according to the divisions and the resources are displayed according to this structure. To learn how to add the resources to the divisions, see Adjust the division structure. In Outlook 2007 click Extras in the InLoox PM Toolbar and choose Resources from the list. You can also load resources for a specific project or for the specific planning element. For more information, see Call up and manage resources. Show work package details Select one work package from the structure and click Open Work Package in the Actions group. It invokes the Work Package Details dialog box. For more information on how to work with the dialog box, see Manage the work package view. Assign another resource to the work package Select one work package from the structure and click Reassign in the Actions group. In the Address book dialog box select another resources. To learn how to do this, see Add resources. Define the time frames On the Start tab, in the Current view group, click Date Range. Choose from the drop-down list between Today, Week, Month and Year. You can also enter your own data by clicking Custom. All resources that are not occupied during the defined period are hidden. Use the button Add resources to always display resources with whom you work often, regardless of the date settings. Print resources On the Start tab, in the Current view group, click Print Overview or Load Chart to start the quick print feature of the resources. For more information about printing, see Print the project list, in the Print in the project list section. Refresh Use the Refresh button to update all changes and reload the view. This button can be found on the Start tab in the Current view group. Show exchange calendar On the Start tab, in the Display group, click Exchange Calendar. This option displays or hides the information of the Free/Busy feature of Microsoft Exchange Server. InLoox PM takes account of the Exchange Server calendar information when calculating the workload, if this option is activated. 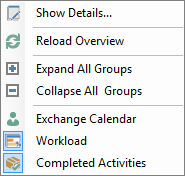 Show workload labels On the Start tab, in the Display group, click Workload. This option displays the work load in percent in the time bars. Show completed activities On the Start tab, in the Display group, click Include Complete. All activities with the status "done" will be displayed, if this option is activated. Display the side panel for divisions and teams By clicking the button Divisions and Teams, in the Display group, you can display or hide the side panel. Add a resource To include another resource into the analysis it is necessary to add it. On the Start tab, in the Display group, click Divisions and Teams in the Resources group, click Add Resource. On the side panel you can choose between divisions and team and drag the needed resource. Via Drag& Drop you can also remove the selected division and team back to the side panel. To learn how to add the resources to the divicions or teams, see Adjust the division structure and Add resources. at any time for any time period for external resources. in the offline mode for internal resources. The context menu provides you with almost all basic features that can also be found on the InLoox PM Ribbon, namely Add Resources, Delete Resources, Reset View, Show Exchange Calendar, Show Workload Labels and Show Completed Activities. It also provides features of the workload diagram, like Expand and Collapse All Groups, Show Details. Right-click in the resource list or the workload chart to open the context menu. How to manage resource capacitities and optimize workload | InLoox PM 8 • Copyright 1999-2019 © InLoox, Inc. All rights reserved.